Fusing your favorite costumes has just gotten a lot easier! In this Cosmetic Fusion System Update, you can decide what you would like the outcome of your fusion to be. All cosmetic items, including back, face accessories, head/hat items, and body costumes are fused using the same tablet. Use this tablet to combine any normal cosmetic items together to create the type of costume you need! All cosmetic items now use the same tablet. No more Costume Fusion Tablet and Accessory Fusion Tablet distinctions. Existing Costume and Accessory Fusion Tablets are automatically updated to the new Cosmetic Fusion Tablet and have the same function as these new tablets! Existing Rune Maintain Slates have automatically been updated to the new Rune Fusion Charm and have the same function as these new charms! Two of any normal costume item can now be used in fusion. No more waiting to use two back accessories to fuse a new one! Right click the Cosmetic Fusion Tablet to gain access to the Fusion Tablet window. Cosmetic Fusion Tablet: Use this tablet to fuse two cosmetic items together for a chance at more runeholes or a random costume! Use special charms to influence fusion for a special result! What it Does: Right click this tablet to open the Fusion Tablet window. This tablet is required for every fusion attempt and is consumed upon fusing the items. Appearance Fusion Charm: Use this charm with a Cosmetic Fusion Tablet in order to retain the appearance of the selected costume! You can select either costume item to retain the appearance of. This charm can be used with Rune Fusion Charm. Rune Fusion Charm: Use this charm with a Cosmetic Fusion Tablet in order to retain your runes and have a chance at more runeholes! What it Does: This charm allows you to preserve your existing runes and runeholes in one costume item. When used with an Appearance Fusion Charm, the runes that will be preserved will be the same as the costume that you select to preserve the appearance of. Existing runes will be transferred over. You do not need to have runeholes punched or filled in the costume to have the runeholes transfer. This charm provides a BONUS chance to receive additional runeholes. Magic Fusion Charm: Use this charm with a Cosmetic Fusion Tablet in order to have a chance to get a Cheny cosmetic item! This charm is only available through the Cheny Shop. What it Does: This charm allows you to use two normal costume items to have a chance at a Cheny item. Cheny cosmetic items, such as Kafra Ruby or Swag, cannot be used in normal fusion. 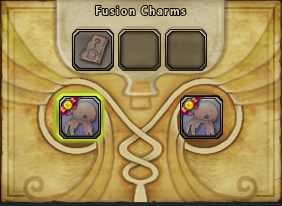 This charm increases the chance that you will receive one of these magic costume items in fusion. This charm cannot be combined with other charms. Head Fusion Charm: Use this charm with a Cosmetic Fusion Tablet in order to receive a head slot item! What it Does: This charm allows you to combine any two normal cosmetic items in order to create a new head slot item. The head slot items are the upper head, or hat, slot. This charm can be combined with Rune Fusion Charm to increase your chance at receiving runeholes or to transfer existing runes/runeholes to a new type of costume. Lower Face Fusion Charm: Use this charm with a Cosmetic Fusion Tablet in order to receive a lower face slot item! What it Does: This charm allows you to combine any two normal cosmetic items in order to create a new lower face slot item. This charm can be combined with Rune Fusion Charm to increase your chance at receiving runeholes or to transfer existing runes/runeholes to a new type of costume. Face Fusion Charm: Use this charm with a Cosmetic Fusion Tablet in order to receive a face slot item! What it Does: This charm allows you to combine any two normal cosmetic items in order to create a new (middle) face slot item. 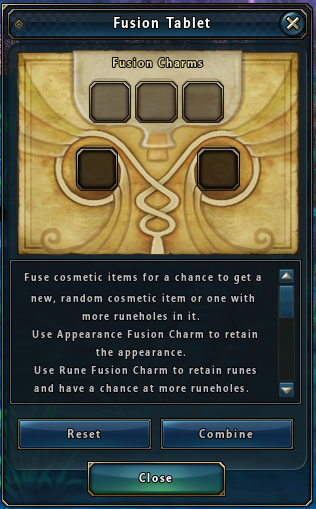 This charm can be combined with Rune Fusion Charm to increase your chance at receiving runeholes or to transfer existing runes/runeholes to a new type of costume. Top Fusion Charm: Use this charm with a Cosmetic Fusion Tablet in order to receive a face slot item! What it Does: This charm allows you to combine any two normal cosmetic items in order to create a new top slot item. The top slot is the chest or body costume item. This charm can be combined with Rune Fusion Charm to increase your chance at receiving runeholes or to transfer existing runes/runeholes to a new type of costume. Back Fusion Charm: Use this charm with a Cosmetic Fusion Tablet in order to receive a back slot item! What it Does: This charm allows you to combine any two normal cosmetic items in order to create a new back slot item. This charm can be combined with Rune Fusion Charm to increase your chance at receiving runeholes or to transfer existing runes/runeholes to a new type of costume. Every charm but the Magic Fusion Charm is available in the Kafra Shop. 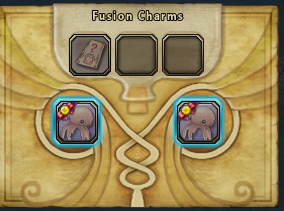 Rune Fusion Charms can be combined with all other fusion charms aside from the Magic Fusion Charm. Appearance Fusion Charm can be combined with Rune Fusion Charm, but cannot be combined with other types of charms for obvious reasons. Rune Fusion Charm boosts runehole acquisition chances. Magic Fusion Charm boosts magic (Cheny) costume item chances. 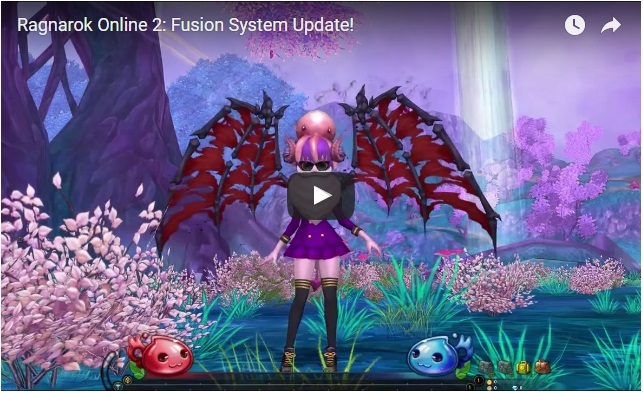 Watch the fusion system video guide to see the new items in action!